Well, it’s been just over a month since the Gears of War 2 Combustible Map Pack was launched as a premium Xbox Live download. This map pack includes three new maps named Flood, Fuel Station and Gold Rush. Lucky I was able to get my grubby hands on this map pack for some multiplayer mayhem. Let’s start with the Flood map. This is a challenging map in that over time, your field of play is slowly reduced to a fraction of its size as Imulsion steadily rises to cover up the edges. It is very important to ensure that you have solid teamwork here to make quick work of you opponents. 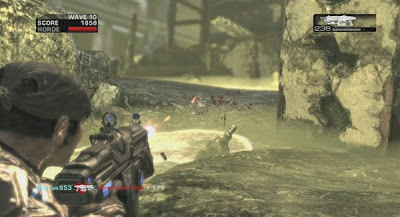 As the Imulsion engulfs the playing field, you will be forced to squeeze into the middle of the map where there is little cover and it becomes an open fire fight. Every now and then you’ll hear an eruption and your controller will rumble. This is your cue that the Imulsion is building up...so take notice. If your team hasn’t taken out the opposition by the second or third cue, now’s the time to do so. I thought the overall concept of this map made for an interesting twist on the multiplayer experience and its particular emphasis on teamwork in order to come out on top. Fuel Station is a fun map and seems to be the most compact of the three. There is a fuel station (hence the map name) located in the middle of the map that can be occupied inside as well as on the roof. You’ll find that much of the battle normally takes place within or just around the fuel station and this makes for some intense close range combat. You'll want to hone your skills with the shotgun or pick and choose spots around that map where you can spring up on an opponent and surprise them from behind with a good ol' chainsaw attack. From a teamwork perspective, if your team can occupy the fuel station first, then you should have a strong position to fight off the opposition. I've found that placing one or two team members on the roof (to provide a top level view of things as well as good cover fire) and the rest within or around the fuel station works best. Last but not least is the Gold Rush map. This is my favourite of the three. The setting is an abandoned Imulsion refinery where the map looks and feels quite large in size. The overall design is linear with spawning areas on opposite sides. In the middle is an elevated platform that can be accessed from either ends of the map. This platform is also where you can pick up a Longshot rifle and put your sniper skills to the test on any unsuspecting enemies below. Scattered abundantly throughout are various structures that you can make good use of for cover. This comes in very handy due to the map's linear and open design. 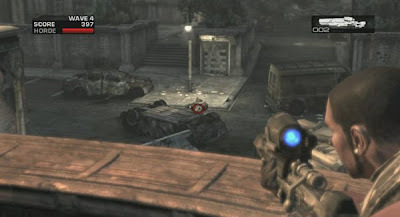 Take advantage of the cover as you spot enemies running towards you from the other side and start firing away or to protect yourself from an overhead attack coming from the elevated platform. The various structures are also very good for planting grenade as proximity mines for unsuspecting foes. Overall I'd have to say that all three maps are a lot of fun and will provide hours upon hours of additional online multiplayer gaming. 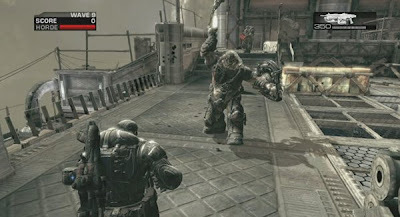 In addition, it's something fresh and different especially once you've exhausted all of the existing maps for Gears 2. For the price of 800 MS points, this is one premium download that you'll likely want to have if you are a fan of Gears of War 2, and more importantly a bigger fan of the multiplayer.